It is 'time' (sorry!) 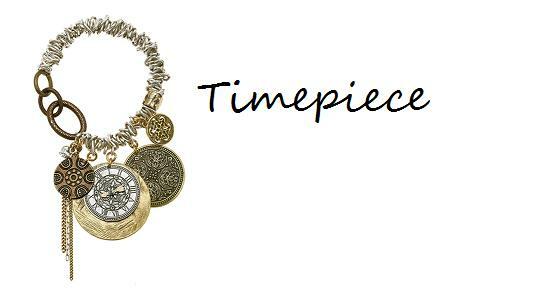 to introduce this stylish and fun series with ornate discs and clock faces. Available in burnished silver plate AND mixed 12K gold/brass/copper plates. Gorgeous dangly style earrings with ornate 'cut-out' discs(1.5cm/15mm), small puffed hearts (5mm), ring with raised heart details. Earrings measure 6.5cm/65mm in total length. French clasp for pierced ears. Pretty stretch style charm bracelet. Crushed links refers to the close arrangement of the bracelet links (the links are not crushed in texture), the band is approx. 1cm/10mm wide. Beautifully textured oval links and detailed discs measure from 1.5cm/15mm up to 3.5cm/35mm. Un-stretch the inner circumference measures 14cm/5.5 inches. Stylish dangly style earrings with clock-face discs (2cm/20mm), small puffed hearts (5mm) and strands of chain. Earrings measure 8.5cm/85mm in total length. French clasp for pierced ears. Pretty disc link charm bracelet. Beautifully textured oval links and detailed discs measure from 1.5cm/15mm up to 3.5cm/35mm. 7 inches/18 cm to an adjustable 9 inches/23cm.